We offer prescription strength acne treatments that are effective in treating acne in its various forms. Our treatments are clinically proven to help, heal, and prevent acne and the affects caused by acne. There are many types of acne and we can treat them all. Whilst acne is a systemic condition, it manifests itself in different ways such as those below. 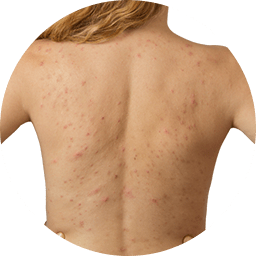 Whichever type of acne you believe you're suffering from, our consultation will help you identify the best treatment to help combat your symptoms. Dermatica's acne subscription packages offer prescription medication to suit your needs. Our dermatology consultation will make sure you are getting the best and most effective treatment for your skin. Tretinoin is a retinoid prescription medication that not only hinders pore blockages that in turn prevents the formation of blackheads, Tretinoin also works with your cells to speed up skin cell life cycle, stimulating skin growth. Tazarotene is a third generation retinoid that works to fight acne and promote skin cell reproduction. Tazarotene affects skin cell growth and thereby helps to reduce the formation of pimples that acne cause. Adapalene is a topical retinoid treatment used to decrease the number of acne pimples and quick healing of pimples that do appear. Adapalene also reduces swelling and inflammation caused by acne. Benzoyl Peroxide is a drug that works to destroy the acne causing bacteria that create blackheads, whiteheads, and pimples. Benzoyl Peroxide works in three ways, killing bacteria, reducing inflammation, and unplugging blocked pores. Azelaic acid attacks bacterium called Propionibacterium acnes, which play an essential part in causing acne. Azelaic acid also acts to reduce the growth of the harder outermost skin cells that block pores and cause blackheads and whiteheads. Clindamycin is an antibiotic used to stop the multiplication of bacteria known to cause spots through acne. Clindamycin also helps decrease the swelling that acne causes. Follow the 3 simple steps to well balanced skin. 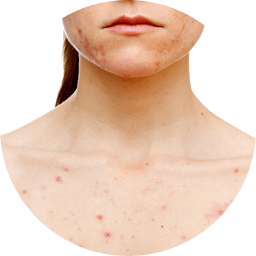 Acne is a common skin condition that affects most people at some point. It causes spots, oily skin and sometimes skin that's hot or painful to touch. Dr Spierings is a leading consultant dermatologist in the UK with a keen interest in the development of cosmetically acceptable and effective skincare products for a range of inflammatory conditions.